A quick apology: I said that I would have this blog post up on Thursday(! ), and here I am five days late. We are getting to the meatiest part of Vanessa the Wonder-worker, and I find that if I don’t have the right kind of time to do these reflections, I don’t want to do them at all. So that’s been one issue. The other thing I didn’t reckon on … Lent. Lent! Such a blessed time of the year, but if it’s part of your Christian tradition to use these weeks to fast more, pray more, address your sins more, don’t you find every year that it is the time when … well, when all hell breaks loose? At one point in my life, I went over past Lents and realized that all the biggest life events –from losing a loved one to quitting a job to getting married — either happened or got ready to happen during Lent. I won’t go over my litany of woes right now — probably everyone has one of their own. But if I’m going to make a connection with what happens in this chapter of Vanessa the Wonder-worker, it might just be that God in His mercy gives us moments, glimmers of brighter things, that help offset the hardships we have to endure. There is no fast in the Church that doesn’t end in a feast. And even when all the storm clouds seem to be amassing on the horizon, you can be occasionally surprised by something embued with the scent of the age to come — some momentary visitation. 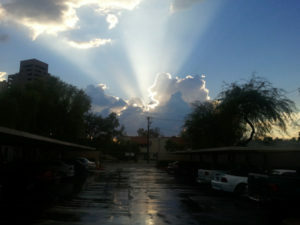 I took this photo a few years ago in Phoenix after a storm. It’s the best I can do to capture the kind of heavenly vision I’m talking about. That, as it turns out, is the great secret that Vanessa has been keeping. It’s something utterly private — she and her mother were the only ones who knew — but she is finally moved to share it with her brother. “I can recall everything about that moment — how my room looked and what Mom was wearing. And whenever I remember it, I have the same feeling I had right then. I feel just surrounded by goodness, like being wrapped in a blanket. So much goodness. So much —” She struggled for a word. “Holiness,” she said at last. It is the briefest experience, perhaps, of the heavenly realm. Not even a experience — just the memory of one. But in spite of outlandish stories that have come our way of people seeing spectacular visions of heaven during those out-of-body phenomena, I’m convinced that in this temporal life, we never really receive more than a glimpse — because I don’t think we could handle more than a glimpse. I heard a story once from a priest. Another priest he knew named Fr. Michael was battling cancer and knew that it was gaining the upper hand. His physicians confirmed for him that his cancer was terminal and that he didn’t have long to live. In abject misery, this Fr. 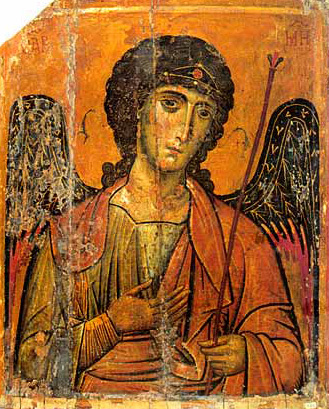 Michael went to his church and prayed before the icons, asking God why this had to happen. He said later that as he raised his eyes, he saw a great movement from the icon of his patron saint, the archangel Michael. He realized in terror and amazement that he was seeing the movement of the archangel’s foot — just his foot! — leaving the icon. Fr. Michael told his friend that it was over in a moment. But he knew that it wasn’t some kind of hallucination or delusion. He saw what he saw. And from that moment, he told his friend, he no longer had any questions to put to God. Fr. Michael did in fact pass away a short time later, but he never lost the peace that he had been given. That, it seems to me, is how a vision of the heavenly realities would really be. Momentary. Overwhelming. And open to interpretation from skeptics, because in all things, God respects our free will and leaves room for doubters. That is the kind of thing that I had in mind. Vanessa doesn’t remember seeing or hearing angels, exactly. All she has is a memory of what it felt like when she did see and hear them — in those innocent years of childhood that none of us can recover. She knows in her heart that her memory is of something real, but she also keeps the whole thing a secret, because she realizes that it sounds kind of crazy. That is what she trusts James with. And even though he can’t handle the idea of such a thing, it begins to plant a seed of doubt. It will take other things to water and fertilize that seed, but that comes later. For now, it’s just an irritation to him, like the grain of sand that becomes a pearl. Next time (and I will try to get this done by Thursday at the latest! ): Chapter 24, when we find out something terribly important about Mary.